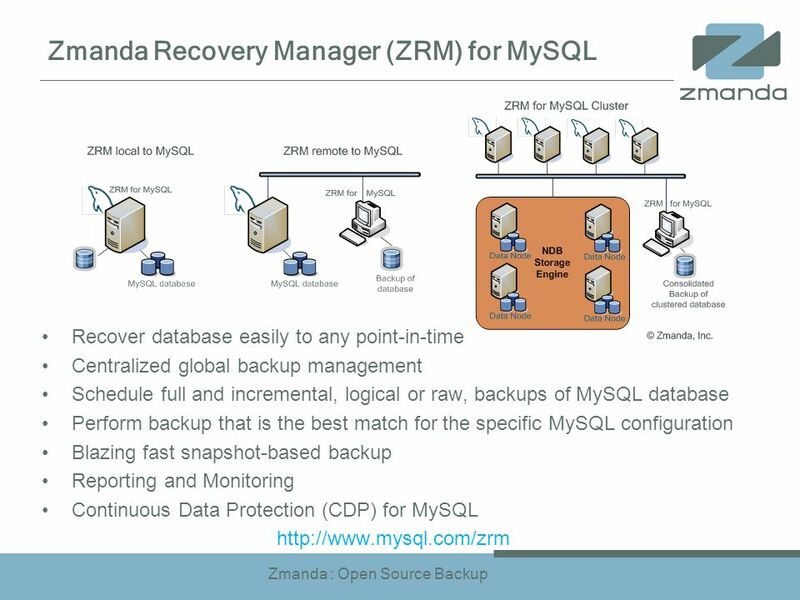 Zmanda : Open Source Backup Radically Simple Backup & Recovery for Live MySQL Chander Kant CEO Zmanda www.zmanda.com MySQL Partner of the Year ! 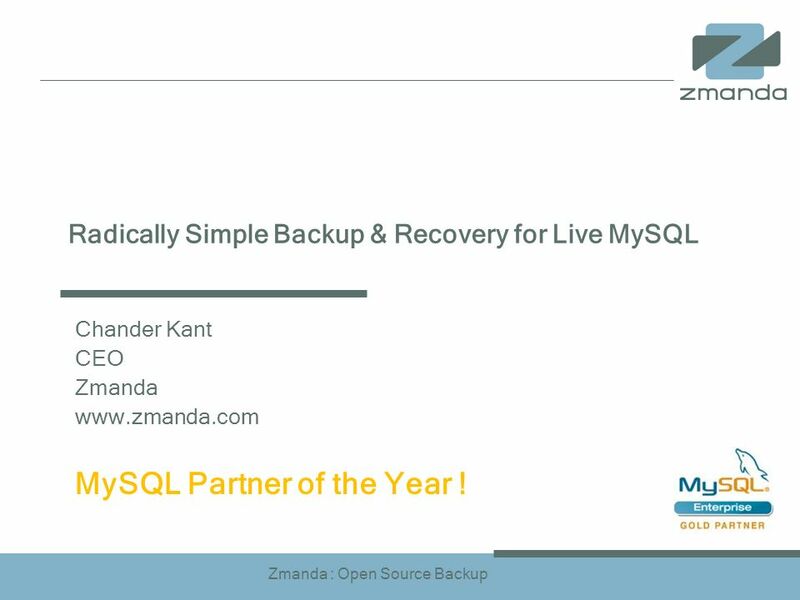 1 Zmanda : Open Source Backup Radically Simple Backup & Recovery for Live MySQL Chander Kant CEO Zmanda www.zmanda.com MySQL Partner of the Year ! 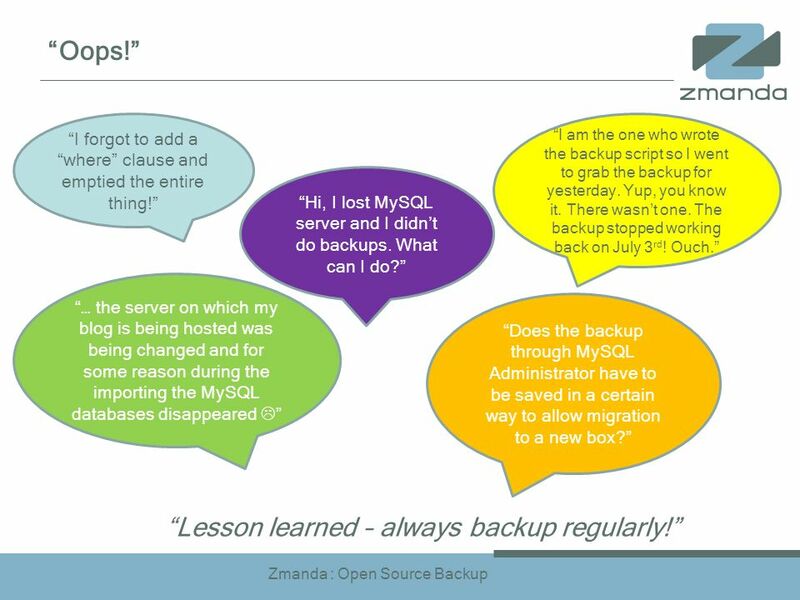 4 Zmanda : Open Source Backup Oops! I forgot to add a where clause and emptied the entire thing! I am the one who wrote the backup script so I went to grab the backup for yesterday. Yup, you know it. There wasnt one. The backup stopped working back on July 3 rd ! Ouch. … the server on which my blog is being hosted was being changed and for some reason during the importing the MySQL databases disappeared Does the backup through MySQL Administrator have to be saved in a certain way to allow migration to a new box? 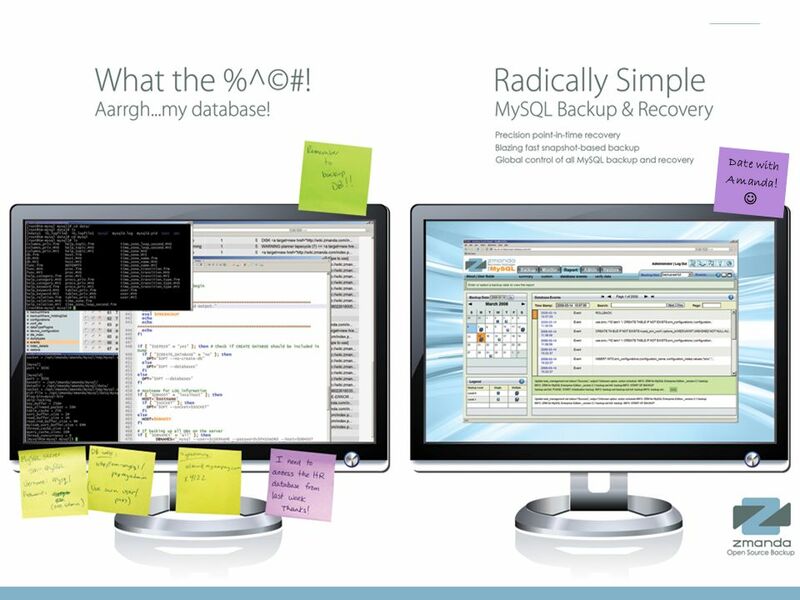 Hi, I lost MySQL server and I didnt do backups. What can I do? Lesson learned – always backup regularly! 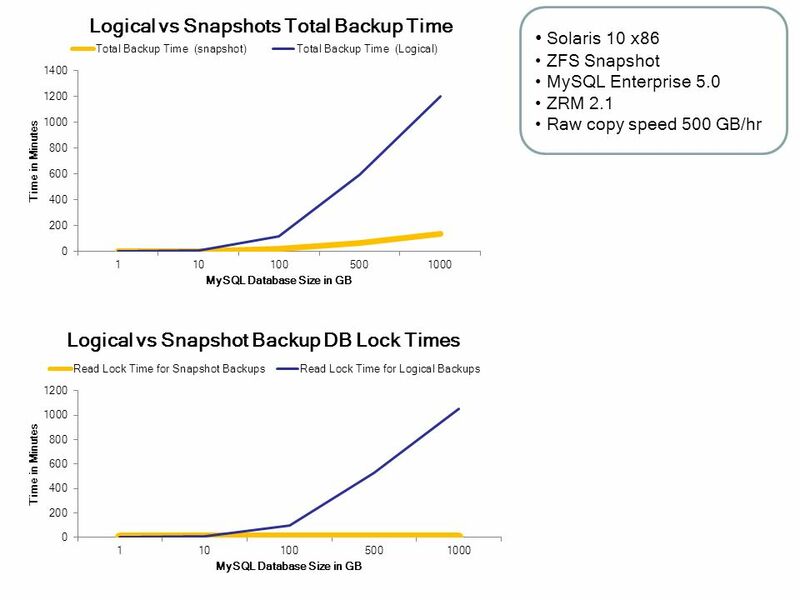 5 Zmanda : Open Source Backup Top considerations for a MySQL backup solution Performance –Impact of the Backup Window –How fast your restore needs to be? (RTO) –How precise your restore needs to be? (RPO) Scale Up –10GB -> 100GB -> 1TB -> ?? –Organic growth Longer retention Scale Out –Wiki, Forums, Web registration database, Sugar, Alfresco, ….. –Multiple locations Security –Arent you backing up your crown jewels? 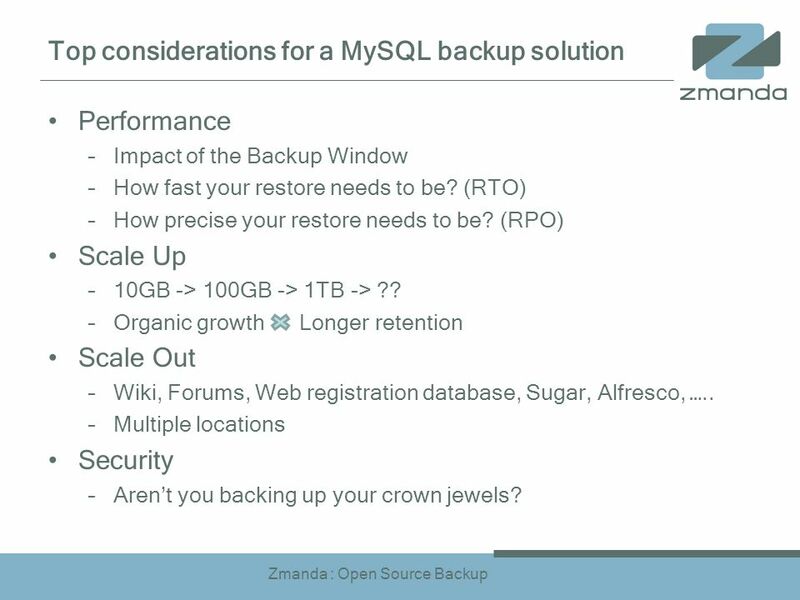 9 Zmanda : Open Source Backup Anytime. Anywhere. 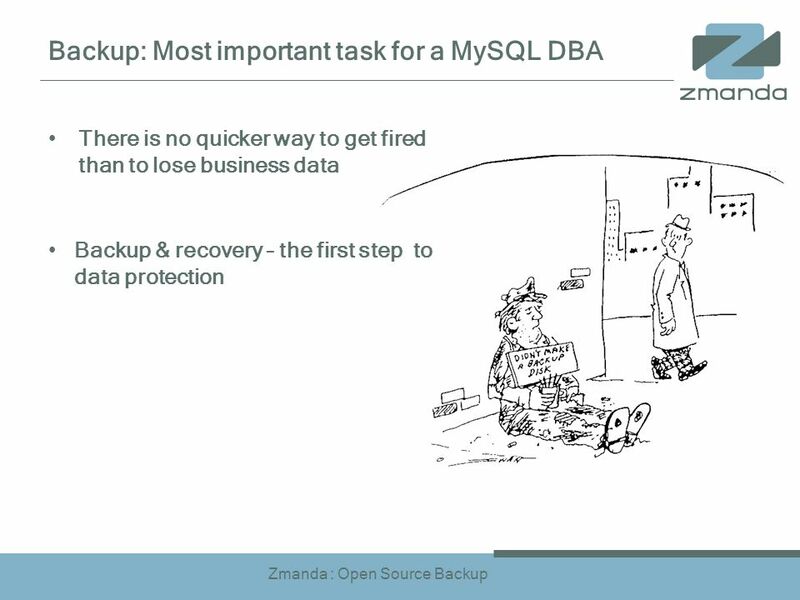 19 Zmanda : Open Source Backup Amazon Mechanical Turk: Protected by Zmanda mturk.com On-demand scalable 24x7 workforce Zmanda Recovery Manager provides backup for more than a dozen fleets of MySQL Servers Backs up data to Amazon S3! 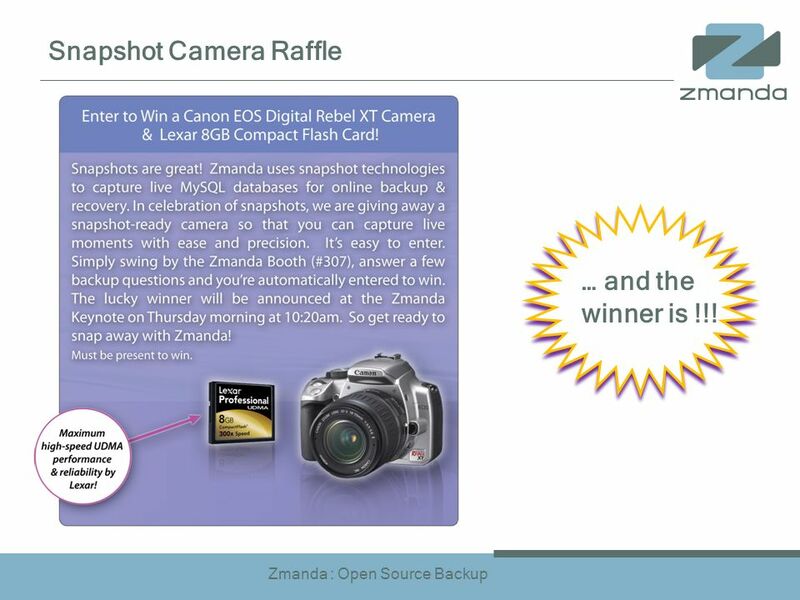 21 Zmanda : Open Source Backup Date with Amanda ! 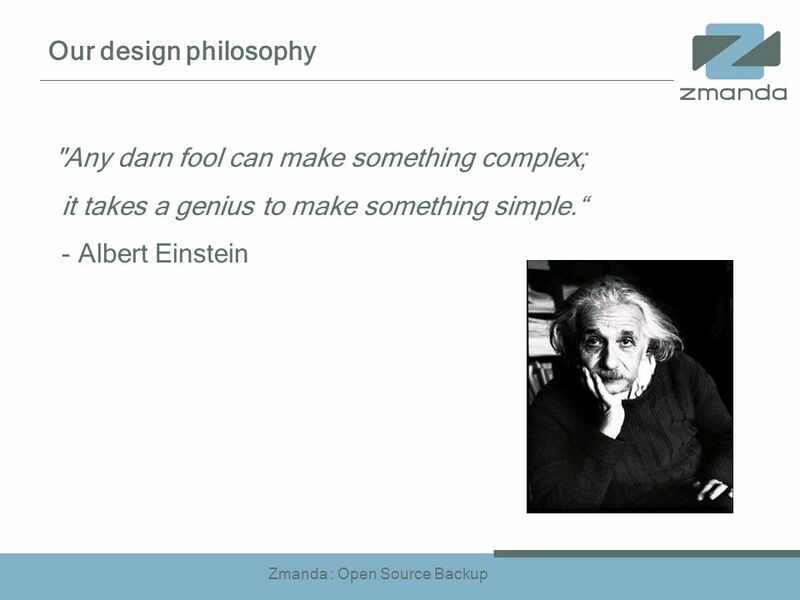 Download ppt "Zmanda : Open Source Backup Radically Simple Backup & Recovery for Live MySQL Chander Kant CEO Zmanda www.zmanda.com MySQL Partner of the Year !" Unified Communications Bill Palmer ADNET Technologies, Inc.
Introduction to InMage Solutions Eric Burgener Senior Vice President, Product Management May2009. 1/16/20141 Introduction to InMage Solutions Eric Burgener Senior Vice President, Product Management December 2009. 1/17/20141 Leveraging Cloudbursting To Drive Down IT Costs Eric Burgener Senior Vice President, Product Marketing March 9, 2010. 1 Building a Dynamic Datacenter with Oracle over NFS and NetApp Blackboard Managed Hosting (sm) Peter Waterman Senior Manager of Technology and Innovation. Hello i am so and so, title/role and a little background on myself (i.e. former microsoft employee or anything interesting) set context for what going. © 2006 DataCore Software Corp DataCore Traveller Travel in Time : Do More with Time The Continuous Protection and Recovery (CPR) Solution Time Optimized. Introducing FailSafeSolutions Online Backup Software. 1 Advanstor TM. Company Confidential 2 Business issues driving change in data protection Data is growing at 100% per year Weekend backup windows are non-existent. 1 Zmanda Cloud Backup Economics of Cloud Storage vs. Traditional Removable Media Chander Kant CEO Zmanda, Inc.
1 Disk Based Disaster Recovery & Data Replication Solutions Gavin Cole Storage Consultant SEE. TUF23: TRIM User Forum 2010 Changing the Economics of IM Michael Andrews Backup & Recovery Sales, South Pacific. Built on Azure, Moodle Helps Educators Create Proprietary Private Web Sites Filled with Dynamic Courses that Extend Learning Anytime, Anywhere MICROSOFT.